The microScan3 is part of a powerful new generation of safety laser scanners designed to get your plant Industry 4.0 ready. Every version of the microScan3 is equipped with safeHDDM (High Definition Distance Measurement) scanning technology generating more the 80,000 pulses per scan, making it highly resistant to ambient light, dust & dirt in the air & on the screen, flying sparks, and mutual interference from other devices. safeHDDM allows for more sensor data to be collected. This data combined with intelligent algorithms create a much more reliable scanner performance. safeHDDM is just one of many features that are part of every version of the microScan3 that decreases downtime and increases productivity. Watch the 5-minute video below to learn about the EtherNet IP & PROFINET version of the microScan3. The microScan3 EtherNet/IP communicates directly with safety PLCs on an EtherNet/IP safe bus system via CIP safety. This is the first scanner on the market with this capability! The microScan3 PROFINET communicates directly with safety PLCs on a PROFINET safe bus system via PROFIsafe. The communication with a safety PLC simplifies installation and configuration with fewer wires and minimal hardware, and reduces maintenance, thanks to a centralized access to the scanner. The microScan3 is industry 4.0 ready as all available information collected in the microScan3 is communicated to a safety PLC and other sensors on the network. Also included in the microScan3 is the Sim-4-Safety feature that allows one scanner to do the work of four as four protective fields are activated at the same time. Each protective field has its own output so you can control different parts of a machine with one scanner. This feature is also available in the Pro models with the ability to monitor up to eight protective fields simultaneously. 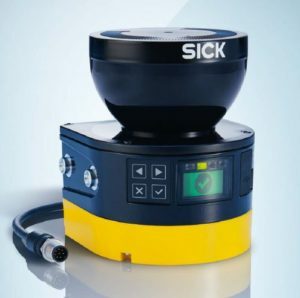 SICK has quickstart guides available to help you integrate our microScan3 EtherNet/IP and PROFINET scanners directly with safety PLCs. Please contact your local SICK representative to have them sent to you.